One of the questions I often raise in my discussion based walking tours is how heritage information sources, like plaques and monuments, function in our urban environment. I recently discovered an app created by HistoricPlaces.ca called Edifica, which combines information on heritage sites with GPS enabled location awareness. I’ve used HistoricPlaces.ca (“a Federal, Provincial and Territorial Collaboration” to collect information about historic places in Canada) in doing research for a number of my tours. I’ve found it to be a useful, if somewhat contradictory, source of information: useful in the sense that it collects a lot of heritage information from a variety of sources, and makes it easily accessible; contradictory in the sense that different agencies sometimes list different reasons for heritage designation of particular buildings and sites. For example, in researching Temple Emanuel for an upcoming tour, I found different provincial/municipal and federal designations, each of which uses different reasons to justify the heritage importance of the synagogue. After testing Edifica in downtown Victoria, my sense is that the user experience leaves much to be desired. Because of the density of heritage buildings and sites in Victoria, I found the map that plots them to be cluttered and hard to use. Either the zoom feature was buggy or this user was incompetent, because the map kept changing scale; heritage site icons were therefore difficult to select, making it frustrating to find more information. When I was able to select particular sites, I found the information about them to be superficial—within the app, each site is described with a single paragraph and between one and three low resolution photographs. While there is a link at the end of each description that provides more information via HistoricPlaces.ca, that requires leaving the app and using a web browser. I expect that the result of these problems would be to leave typical users with a superficial understanding of the heritage sites around them, if they were able to successfully use the app at all. I will be interested to see whether future walking tour participants find Edifica or other mobile digital tools useful in getting to know their city. 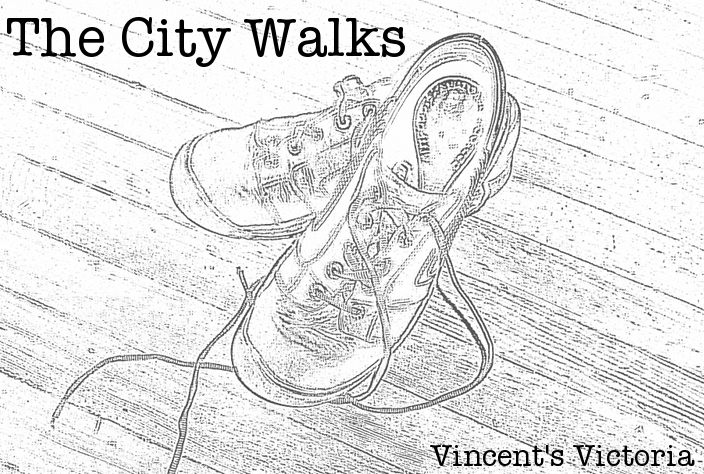 Join me next week to discuss this issue and others (click here for details about when and where to meet and for an outline of the walk). 1Greg Ashworth, “Public Pasts in Plural Societies: Models for Management in the Postsecular City,” in Justin Beaumont & Christopher Baker (eds. ), Postsecular Cities: Space, Theory and Practice (New York: Continuum, 2011), 182. Disclaimer: I am not the owner or publisher of the app described in this post. I cannot guarantee its usefulness, accuracy or safety for any use. Any use of the app is at your own risk and is completely voluntary. Although the app itself is free to download, any data charges are your responsibility. When using the app, please pay attention to its safety and legal warnings. This entry was posted in Events, Historic Sites, Maps & Mapping, Monuments, Pedestrians, UVic, Victoria, Walking Tours. Bookmark the permalink. I tried the app, and found similar results. The map doesn’t zoom as much as one might be used to with other online maps, so it is hard to find the right link. It seemed to be better for locating historic buildings in the vicinity than for finding a link to a specific building you might hope is included. If you are just looking to do a bit of tour on your own, it could be helpful. But if you are looking for more information on a specific site, you are quite possibly out of luck. Al – Thanks for trying out the app. I’m glad to hear that I’m not the only one experiencing these technical problems. If it weren’t for the “buggy” map, would you have found it useful? Ideally, what would “more information” look like in an app like this?